About Geodesic Buildings - Geodesic Domes for sale & rent. At Geodesic Buildings we specialise in the design & manufacture of geodesic domes & PVC dome covers. We are based in Coin on the Costa Del Sol, Spain and can deliver & professionally install custom made domes anywhere in the world. We developed machine tools to mass produce precision made geodesic dome parts and thereby bring our prices down and our product quality standards up to meet European safety standards. We are proud to be among the most economically priced & architecturally certified (more info here and here) geodesic dome & dome cover manufactures in the world. See our price range here. Another part of our business is structural & architectural metalwork including steel construction & building frame work. We work closely with professional architects on larger projects to ensure European safety & insurance standards are met. All geodesic domes, pvc dome covers & structural steelwork can be supplied with this certification if required. Between the 2 main partners we have over 40 years experience in the engineering, construction, welding and metalwork industries here in Spain and in the UK. 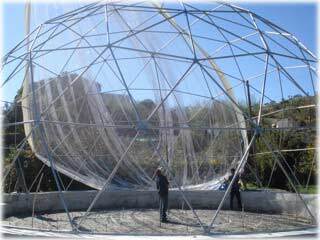 We began manufacturing geodesic domes in 2006 as a somehow logical progression of our busy engineering & construction business. Fast forward to today and there are dozens of sometimes breathtaking dome installations all over Spain, Europe and even the Americas. You can see photos of us and our projects all over this site. If you have any of your own photos of our domes please email us we would love to see them! We speak fluent Spanish & English. Give us a call directly on the mobile number below if you have any questions or request a quote right now.